Is there Sugar in Baby Food? Does Your Baby Eat Hidden Sugar? Hidden sugar is found in so many foods, including baby foods and foods marketed specifically to children. We are often not even aware of it’s pervasive and insidious presence. Read the labels to find hidden sugar – make your own foods, snacks to help be sugar free! You may have heard about a lawsuit involving deceptive labeling in January 2007 and the inclusion of High Fructose Corn Syrup. Specifically, Plaintiff was suing a well-known food company over their labeling of a packaged drink. The packaging claimed that the drink was “all natural”. She (Plaintiff) was shocked to read the label and find that High Fructose Corn Syrup (HFCS) was the 3rd ingredient listed on the package. High fructose corn syrup is used as a sweetener. It is stored in the body, high on the glycemic index and is said to be contributing to unhealthy fat build up. HFCS helps baked goods stay softer for longer periods of time so that the food can remain longer on the grocer’s shelf; you find it even in bread! How can this product claim to be “all natural” and yet contain high fructose corn syrup? Some would argue that high fructose corn syrup is natural as it is derived from corn. While high fructose corn syrup may be derived from corn, it is neither “of the natural world” nor is it technically naturally occurring. High fructose corn syrup is manufactured via a process of extraction and then a subsequent tampering with the cellular structure of corn. In other words, you wouldn’t be able to take home a stalk of corn and mash or chop it to yield high fructose corn syrup. “Natural” sugar on the other hand is taken straight from sugar cane and requires no molecular tampering or restructuring. The aforementioned “all natural” fruit drink contains many sugars and other ingredients that the Plaintiff felt simply should not be in a drink labeled “all natural”. In the United States, food companies are able to get away with this type of deceptive and misleading labeling due to the lax governmental standards and regulations of labeling within the food industry. Hiding behind these lax regulations and standards, the food industry is able to use the words “all natural” on products that may be anything but. To further compound the confusion, the food industry adds cartoon characters, “cool” kids and cute little fuzzy creatures to the packaging in the hopes of enticing children and parents to purchase their product.Searching food labels and uncovering hidden sugars will enable parents to see through the deceptive labels and avoid hidden sugars or other additives. It is very important for parents to learn how to read labels and assess the true nutritional value of the foods they are purchasing for their children. Read the Labels Carefully to Find Hidden Sugar! When reading labels, note the order of appearance of the ingredients. Ingredients are listed from largest to smallest amount (by weight). This means a food will contain the largest amount of the first ingredient; the food will then contain the smallest amount of the last ingredient. In many foods that target children, high fructose corn syrup appears within the first three(3) ingredients listed. These sugar ingredients are even found in some popular commercial infant “finger foods” and other baby & toddler foods. Have you ever read the label of a can of baby finger food Puffs for example? Make sure you are sitting down when you do. You’ll find that this product, marketed as a great finger food for babies, contains a good amount of sugar. Pick up a jar of a commercial baby food “dessert” and find sugar in it’s contents. Why would a baby food company even manufacture “dessert” for an infant? Yogurts Read the labels of popular “kids” yogurts and you will find sugars, corn syrups, and even high fructose corn syrups. Buy a natural brand and mix in your own fruits. Your kids will have that same fruity yogurt without all the added sugars. Apple Cinnamon Cereal Nutragrain Bars See for Yourself Very shocking is the ingredient list of some popular cereal “whole grain” bars. Filling: High Fructose Corn Syrup, Corn Syrup, Apple Purée. The cereal bar itself contains: High Fructose Corn Syrup (main ingredient after the flour ingredients). Make your own cereal bars using healthy ingredients and natural sugar. Natural sugar is more easily processed and utilized by the body than is high fructose corn syrup. Then again, you might be inclined to leave out the sugar entirely and still make a tasty cereal bar. Cheerios: Whole grain Oats, Modified Corn starch, Corn starch, sugar. Buy puffed grain cereals instead and skip the sugar. Make your own healthy grain crackers. It’s simple to do an you can even use small cookie cutters to create animal shapes. One fantastic way to ensure there are no hidden sugars and ensure additive free foods is to make your child’s meals from fresh ingredients. Limit the amount of processed foods that you serve for snacktime and meal time. In an age of epidemic childhood obesity, where the food industry is able to engage in deceptive labeling, it is more important than ever to feed your children fresh and healthy minimally processed foods. 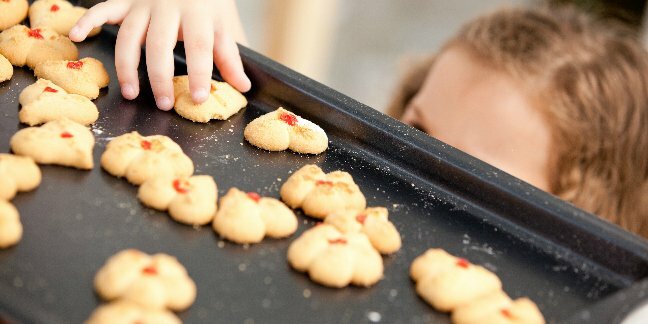 Begin label reading and look for hidden sugars in foods that you purchase for your family; it’s these small steps that will help keed your children healthy.